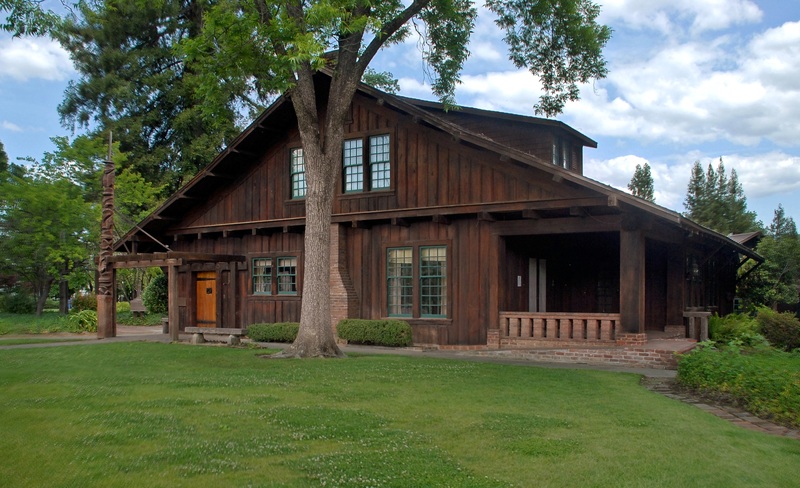 The Sun House, a 1911 redwood Craftsman bungalow, is adjacent to the Grace Hudson Museum in Ukiah. It is both a California Historical Landmark and listed on the National Register of Historic Places. Ukiah, (population 28,000) is the county seat and largest city in Mendocino County, California. The Ukiah Valley was first settled by the Pomo Indians, and its name is a corruption of the Pomo word “yokoyo,” which means “deep valley.” The area’s first non-Indian settlers were A.T. Perkins and family, who arrived in April 1857 and purchased 160 acres of land and a log cabin from Samuel Lowry. While Mendocino County was formed in 1850 along with the state of California, it did not have its own county seat, Ukiah, until 1859. By 1860 the town was surveyed, mapped, and finally incorporated in 1876. The rich river-bottom soils of the Ukiah Valley made the area well-suited for farming, and even today its economy is largely based on agriculture. The county seat designation, along with the arrival of the railroad in 1889, changed the city into a more commercial area. With special excursion-rate train tickets and, in the 1920s, the promotion of the Redwood Highway (route 101), tourism took hold, and has continued to expand today. Ukiah, a Main Street Community, is home to the Held-Poage Memorial Home and Research Library. Associated with the Mendocino County Historical Society, the library is operated by volunteers and provides access to thousands of books, maps, photographs, and other documents and artifacts relating to northern California history. The Grace Hudson Museum, inaugurated in 1986, has become an increasingly important cultural and educational resource for Ukiah as well as the larger region. Located in the Hudson-Carpenter Park, the museum’s extensive collection includes Pomo Indian artifacts, unpublished manuscripts, historic photographs, paintings, and other objects significant in local history. The Ukiah Latitude Observatory is one of six established in 1899 as part of a worldwide network located on the 39th parallel. Used to measure the variation in latitude that occurs as a result of the wobble of the earth’s axis, improving technology made the observatory obsolete by 1982. Friends of Observatory Park, a civic association, working in conjunction with the City of Ukiah, began restoring the observatory in 2007. With a grant from the County of Mendocino Community Foundation, historic interpretive signage was added for the observatory as well as the surrounding park. Heritage Days are observed in Mendocino County every May, and in 2009 the Ukiah Latitude Observatory was nominated and accepted as a venue for the event.